PPV « Believe-In-Rollins.com | Your Most Dedicated Source for Seth Rollins! Seth Rollins may never believe that Bray Wyatt is a “god,” but The Reaper of Souls cast The Architect down all the same in the opening match of the first-ever WWE Great Balls of Fire pay-per-view event, and he did so with absolute relish. 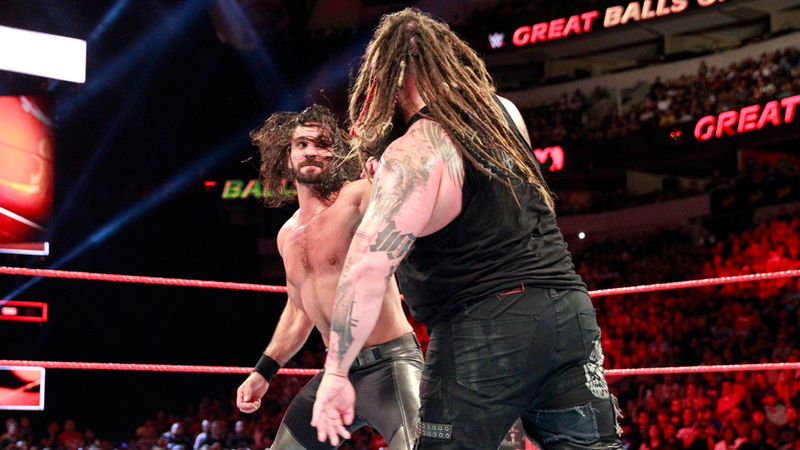 After weeks of absorbing insults — “blasphemy,” in his words — from Rollins, Wyatt seemed to enjoy getting in The Kingslayer’s head in the early goings of their long-brewing confrontation. The Reaper of Souls laughed off The Architect’s early attacks and dangled upside-down off the ring post, stopping Seth cold right as he was about to pounce. Wyatt only turned on the jets once Rollins had been good and duly unmanned, and once he did, The Eater of Worlds quickly looked like a “god” of the Old Testament variety. The Kingslayer was subjected to all manner of savagery, landing face-first on the steel steps before suffering a superplex off the top rope and an unorthodox maneuver that spiked him forehead first into the apron. Alas, boxing with a self-proclaimed “god” turned out to be a bad move for The Man. While the ref attempted to peel Rollins off his foe, Wyatt jabbed The Architect in the eye with his thumb. Quite literally blinded by Wyatt’s power, Rollins was easy pickings for a Sister Abigail that put him down for three. After many weeks we finally have a number one contender, Samoa Joe. A true wreck from the start this match quickly turned into Bray Wyatt and Samoa Joe vs. Everyone. The terrible two wrecked everyone in sight with a set of the steel stairs from the ring. Seth kept battling back into the fray diving each way onto his opponents, but gets shut down with a DDT on the steel steps by Bray Wyatt. The devastating blow would effect Seth for a while as Roman spears Finn Balor & company through the barricade. Seth soon releases he’s the only man left standing in the ring and he devises a plan to destroy Bray Wyatt. Seth flies off the ring post with frog-splash through the announce table. Immediately Seth holds his knee painfully as it took much of the force of his landing. Once he struggles to his feet, he releases he’s directly across from a battered, bloody nosed Roman. The two stare each other down before limping back to the ring. There the two get more fired up as they stand face to face. The fist swinging starts and Seth appears to be getting the upper-hand before he creates some distance, and then gets KO’d with a massive punch. The match gets extremely scattered from there with Rollins giving a massive buckle bomb to Reigns, kicking out of a sister Abigail, and avoiding pinfall attempt after pinfall attempt. Unfortunately, as Samoa Joe wraps Finn Balor up like pretzel, he gets the submission and we leave Extreme Rules with Seth holding his knee painfully after taking his shoe off outside the ring. At Roadblock: End of the Line, Seth Rollins picked up a victory of pure retribution over Chris Jericho. Heading into their showdown, Jericho had cost Rollins the Universal Championship on three separate occasions. Yet, after the six-time World Champion left his best friend, Universal Champion Kevin Owens, at Roman Reigns’ mercy on Monday’s Raw, it appeared he would be forced to face The Architect without KO’s help. Prior to the match, Rollins made it clear that he wanted Triple H and he would be going through Jericho to get to him. However, for the time being, he would need to focus every bit of his energy on the very dangerous opponent in front of him. The subsequent contest was a completely brutal back-and-forth, with both Superstars utilizing everything they had both inside and outside the ring. Jericho was in charge for much of the match. Yet, no matter what was thrown at him, Rollins refused to give in. Before long, the two Superstars were going shot for shot and finishing maneuver for finishing maneuver, including Rollins fighting his way out of not one, but two Walls of Jericho. Then, in the height of the action, Kevin Owens suddenly emerged and climbed on the apron to cause a distraction. While it looked as if KO might have been making amends with his best friend, his efforts were met with angry screams from Jericho. Moreover, the commotion Owens paved the way for Rollins to hit the Pedigree for the three-count and put an end to the hard-fought contest. It seemed that Jericho and Owens’ friendship had reached the end of the line, but it became clear that Jericho, in a clever ruse, had delivered the DQ-inducing blow on purpose so his buddy could retain the title (in a match vs. Roman Reigns). The two cohorts tried to get out of Dodge, but they were cut off at the pass by Seth Rollins, who proceeded to join up with Reigns to put both Jericho and Owens through two separate tables in classic Shield style. The savagery was undoubtedly satisfying for The Big Dog, but his journey to dethrone Owens is far from over. The Kevin Owens Show has survived its one-off episode in Hell to roll on for at least another night, as the WWE Universal Championship both arrived and left Boston in the clutches of The Prizefighter, while Seth Rollins was left empty-handed yet again. Though, to be entirely fair, the third-act twist wasn’t entirely due to the merits of The KO Show’s namesake, as a most unexpected guest star crashed the Cell. In case you couldn’t guess, that was Chris Jericho, who made his presence felt after Rollins gritted and grounded his way into position to win the match. That in and of itself was a miracle after KO snuffed out Rollins’ early showing by targeting The Architect’s back, ripping off Rollins’ Kinesio tape before savaging him all across the cage. Rollins was able to keep himself in the fight, but when Owens accidentally blasted one of the officials in the face with a fire extinguisher, Jericho took advantage of the briefly open Cell door to lock himself inside and pocket the key.